Prominent & Leading Wholesale Trader from New Delhi, we offer autofy bike front glass windshield (bajaj avenger) and autofy riding gear t-shirts. Autofy front fibre glass windshield for Bajaj Avenger gives you a more confident and safe bike riding experience and is now available at a very low and reasonable price. It is made of premium quality high impact injection moulded plastic to handle extreme impact conditions. The windshield is sturdy and highly durable. The premium quality helps to withstand heavy impacts and maintain shape even in extreme conditions. The transparent look does not reflect light and saves you from high speed winds. It also has an aerodynamic edge with the way it pierces the wind giving you stability and control over the road. The careful design makes the installation very easy. The supporter and screw set is used to fix the shield with any drilling or design or structure alterations. This is suitable for all Bajaj Avenger models. Autofy helmets come with the latest designs in use and ISI 4151 certification to ensure your security. The latest catchy design and safe helmets are made of tough and high durable Polycarbonate outer shell. 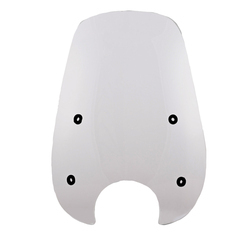 This sturdy outer shell is used to prevent any sharp object to enter the helmet inside. The carefully engineered design has Polypropylene EPS inner liner which has the best foam padding to absorb shocks and impacts. The inner liner increases the time of impact thereby causing the skull to decelerate and hit the helmet walls with less impact thereby preventing skull damage. This safety engineering is taken care in designing our helmets. These helmets have quick release strap mechanism where in the rider just pulls the plastic clip and drags the strap to unlock the helmet. The front open visor less helmet gives a wide open front view while driving and can be used with stylish balaclavas for style statement. The side vents are present to maintain air circulation and lets you breath fresh air all the time which prevents dizziness during long drives and off roadings. This helmet is a perfect for off-roadings, mountain driving, high driving etc. This is a highly used product by bike enthusiasts, biker lovers and biker boys who love their bikes Royal Enfield Bullet Standard 350, Royal Enfield Bullet Standard 500, Royal Enfield Bullet Classic 350, Royal Enfield Bullet Classic 500, Royal Enfield Bullet Classic Desert Storm, Royal Enfield Bullet Electra, Royal Enfield Bullet Thunderbird 350, Royal Enfield Bullet Thunderbird 500, Avenger, Pulsar, Duke KTM, Harley Davidson, Yamaha FZ, R15, CBR, Ninja, Apache, Hayabusa and other bikes.